Born in Crewe, Cheshire in 1948 with a keen interest in art from an early age. Painting has been a hobby over the years - full time from 2012. 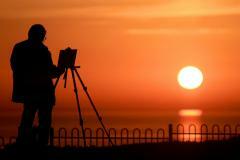 Landscape painter who paints outdoor in front of the subject. Self taught and gained a lot from visiting London exhibitions over the years - also seeking out the opinions of other artists. In addition to commercial galleries, I have exhibited at the Royal Academy Summer Exhibition; the Royal Institute of Oil Painters, The Royal Society of Marine Artists, Mall Galleries and the Chelsea Art Society.